The Renaissance saw new forms of medical study flourish at Rome. Scholars like Raphael's friend Marco Fabio Calvo studied the ancient medical works attributed to Hippocrates. These had been known only in part in the Middle Ages. Read as a whole (and translated into Latin), they offered an important new model for medicine based on close observation and unemotional, precise case histories (of which the Hippocratic texts contained a good many). Anatomists like Juan Valverde de Amusco and Bartolomeo Eustachi followed the lead of Andreas Vesalius, basing their accounts of human bones and blood vessels on the direct evidence they found by dissection, and publishing their results, magnificently illustrated, as improvements on Vesalius's work. The papal library also acquired copies of standard medical works used in the Middle Ages and Renaissance. Portions of the twelfth-century Latin translation of Avicenna's medical encyclopedia were used as textbooks in universities, and the work as a whole served as a medical reference tool. In this copy, numerous miniatures vividly depict patient problems with which the medical practitioner was likely to be confronted. Here a patient has hemorrhoids. Galen's "De usu partium" (second century A.D.) was one of the most important ancient contributions to physiology and anatomy and this work greatly influenced the development of those subjects in the Renaissance. The copy shown here is one of the earliest and best manuscripts, of great significance for establishing the text. It is one of many books that came to the papal library from the libraries of the cardinals. In the fifteenth century, it belonged to Cardinal Jacopo Ammannati Piccolomini, who was a member of humanist circles in Rome. 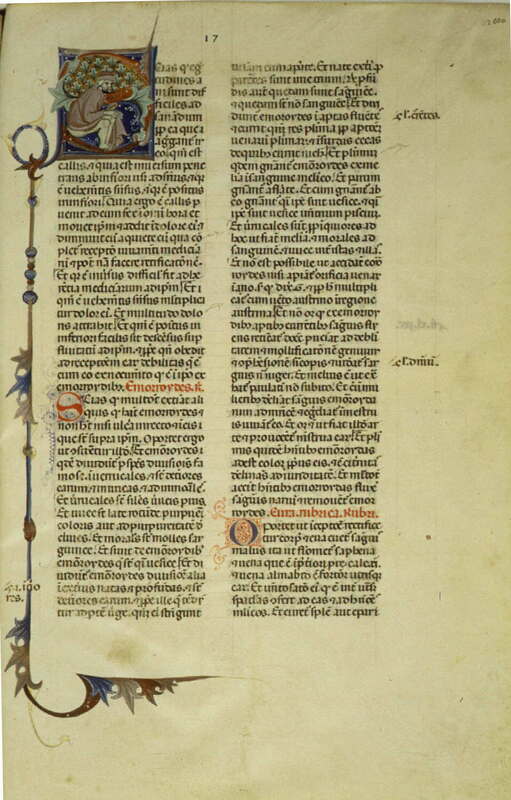 The first Latin translation of the complete corpus of treatises ascribed to Hippocrates (fifth century B.C.) was an important development in Renaissance medical learning. This undertaking, accomplished at Rome by Marco Fabio Calvo (d. ca. 1527), greatly enlarged knowledge of one of the most important ancient medical writers, even though some Hippocratic books had long been available in older translations. 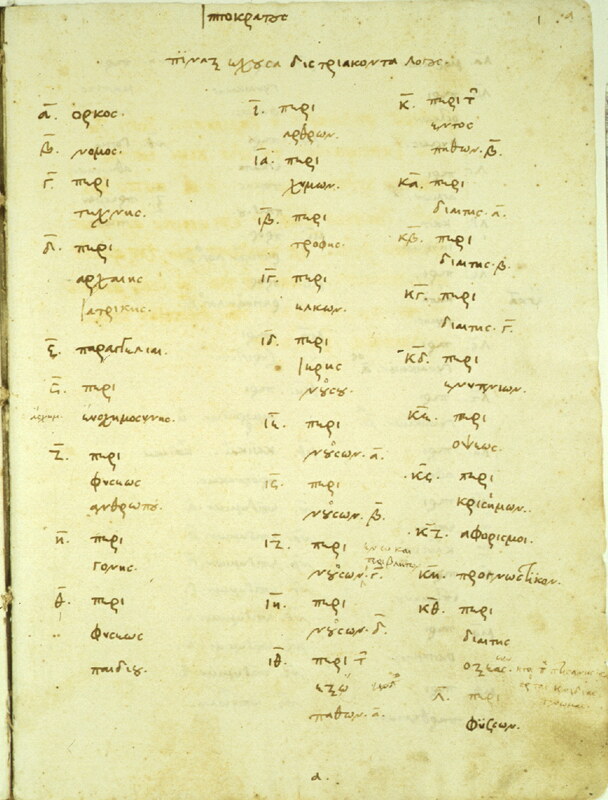 Marco Fabio Calvo based his transcription and translation of the corpus on this fourteenth- century manuscript in the mistaken belief that it was of great antiquity. 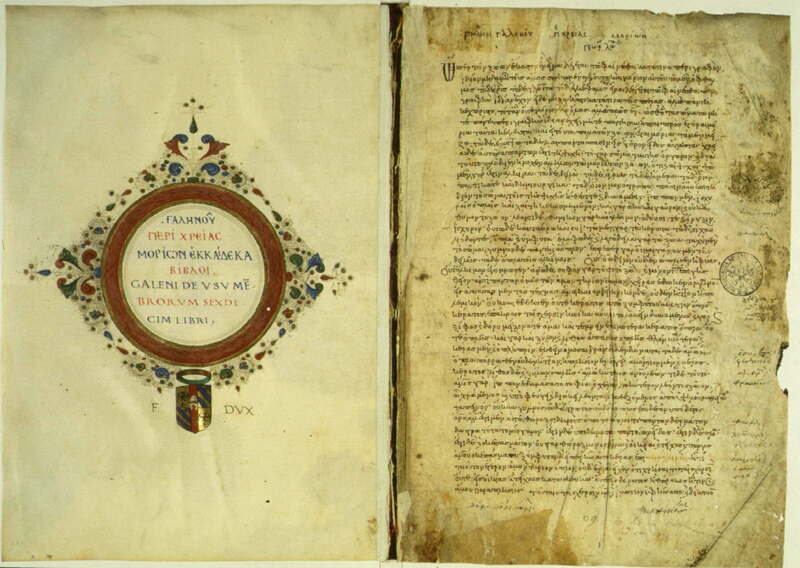 Calvo originally planned to publish a Greek edition as well as a Latin translation of the complete Hippocratic corpus and transcribed the whole Greek text from the older manuscript [Vat. gr. 277 (medbio09)]. Marco Fabio Calvo's Latin translation of the Hippocratic corpus was completed in 1515 and printed at Rome in 1525, by Francesco Calvo, then "apostolic printer" to the papacy. 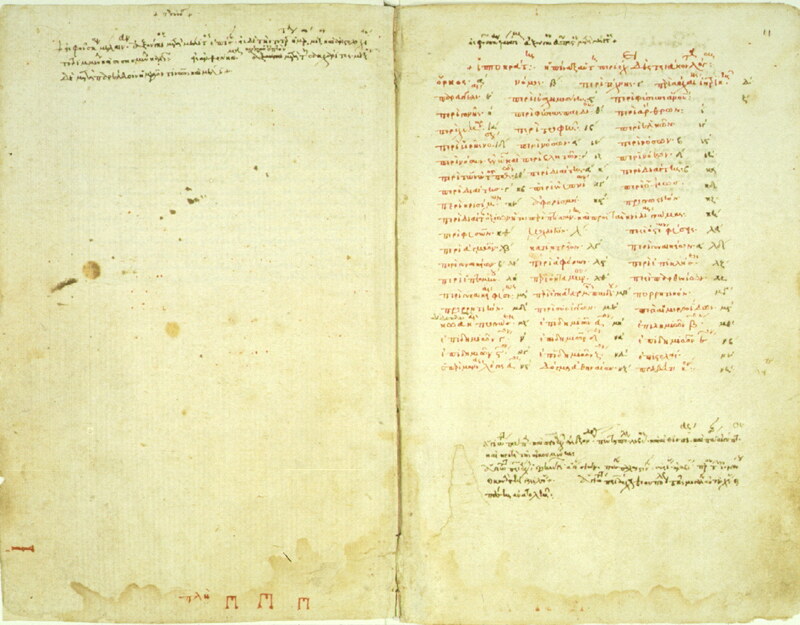 The following year Marco Fabio deposited this holograph manuscript of his Latin translation in the papal library, so that it could serve as an archetype (official text) for future editions of his work. The papal library thus still served as a library of record, as it had for Lorenzo Valla 75 years before. Valverde was one of a group of anatomists who worked in Rome in the middle years of the sixteenth century, when anatomy based on the dissection of the human cadaver was the focus of much scientific and public interest in Italy. In this work, dedicated to Amusco's patron Cardinal Juan Alvarez de Toledo, the author refers to the greater opportunities for anatomical study in Italy, including Rome, as compared to his native Spain. Sharp rivalries existed among anatomists. 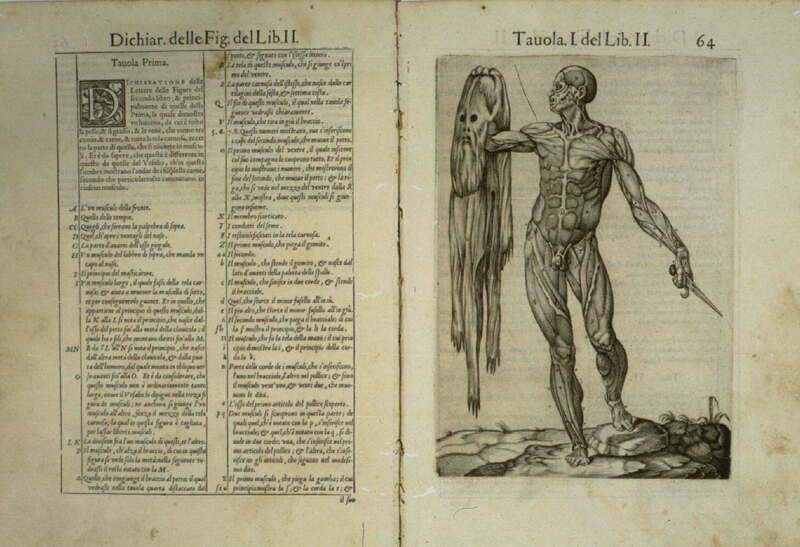 Here, a muscle man holds up his own flayed skin; the accompanying text points out the independence of the illustration from that of the pioneer Andreas Vesalius and discusses the differences with the latter's teaching. Now you should go back to the Main Hall, but you might have another look at Medicine and Biology.